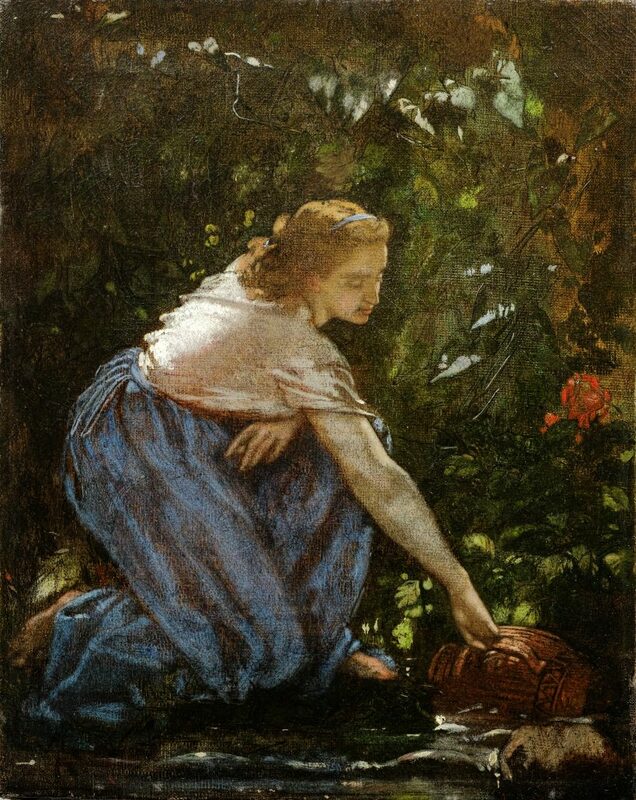 Jeune fille au ruisseau (Young Girl at a Stream), circa 1852, 1853. Oil on canvas. 41 x 33cm. Illegible traces of an inscription, lower left. 1. Collection of Georges Bertauts-Couture, grandson of Thomas Couture, Paris. The present oil study, executed with a first-rate technique, convinces by dint of its compositional structure, its lively freshness and spontaneity. It evidences Feurbach’s savoir-faire in the contemporary, progressive techniques of open-air painting, acquired during his Paris sojourn (November 1852 – May 1853) as a pupil of Thomas Couture, in his atelier on the rue Vintimille. During this period, Anselm Feuerbach, practiced the application of color in a rapid, fluid, cursory manner, and he concentrated on working out a correspondance between light and shadow. In his dramatic presentation of light, the artist rhythmically distributes thick, nearly dry dabs of paint to the brightest zones. The folds of drapery, swiftly brushed, appear supple and lively. This previously unpublished painting, from the succession of Thomas Couture, may be ascribed to Anselm Feuerbach. Similar works for comparison may be consulted in the following: Jurgen Ecker: Anselm Feuerbach. Leben und Werk. Kritischer Katalog der Gemälde, Ölskizzen un Ölstudien, München 1991, Kat. Nrn. 106 bis 159.